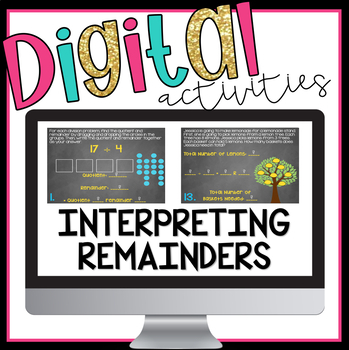 Interpreting Remainders Digital Activities is a Digital Interactive Resource to be used with Google Slides. Students can complete the digital activities in Google slides or in a Google Classroom assignment. 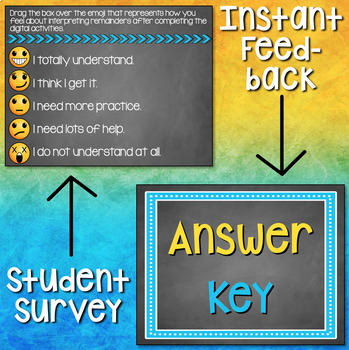 Answer keys for all activities are included, so students can self-correct. 4.OA.3: Solve multistep word problems posed with whole numbers and having whole-number answers using the four operations, including problems in which remainders must be interpreted. Represent these problems using equations with a letter standing for the unknown quantity. 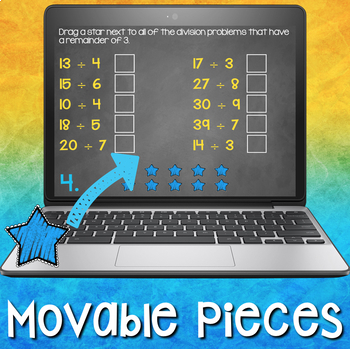 ⭐ Using drag and drop features to determine quotients that contain remainders. ⭐ Identifying quotients with specific remainders. ⭐ Math crosswords that include clues about remainders. 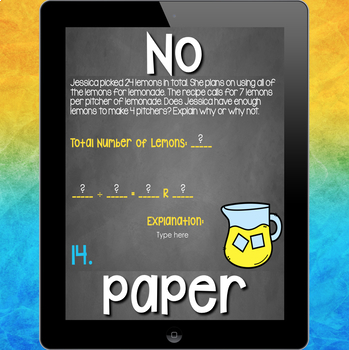 ⭐ Rigorous word problems that involve students deciding how to interpret the remainder.